Day 1 :U.S.A. - Tel Aviv. Fly to Israel capital, Tel Aviv. On arrival you will be met and transferred to your hotel in Jerusalem. Ascend by cable car to the spectacular cliff-top FORTRESS of Masada, and hear how 960 Jewish zealots preferred death at their own hands to the indignity of surrender to overwhelming Roman forces. Around lunchtime, drive through the Judean wilderness to the Dead Sea, the lowest point on the surface of the Earth. Enjoy the scenery along the road between the salty water and majestic desert mountains. Catch glimpses of the caves of Qumran, where the precious Dead Sea Scrolls were found. Later arrive at one of the comfortable Dead Sea resorts to experience the feeling of buoyancy in the heavy water, stay over night in Dead Sea. After breakfast and a drive from Dead Sea to the Jerico, world's oldest city. Complete border crossing procedures and enter into Jordan. Ride into red-rose city of Petra, a unique destination. 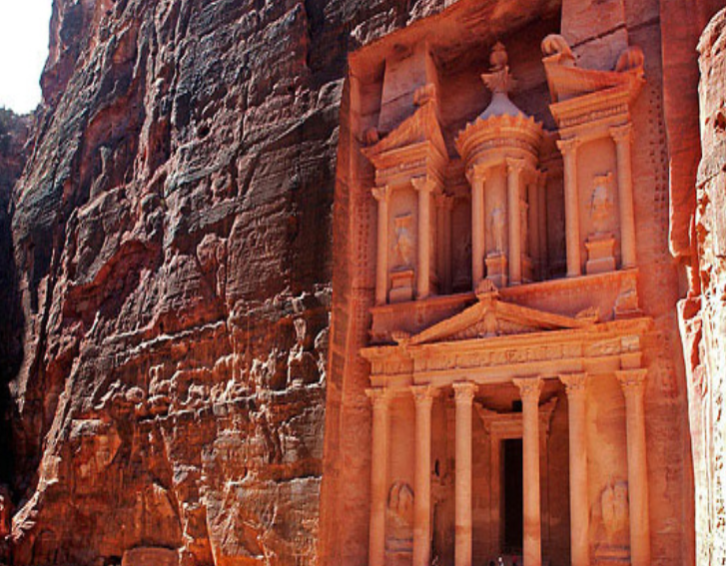 More than 2000 years ago the area was settled by the Nabataeans who carved magnificent buildings in the sandstone. Petra also known as "Sela Edom" or Red Rock City, the ancient capital of the Nabateans from the 3rd Century B.C. to 2nd Century A.D. Visit the most interesting monuments, such as the Treasury, El Khazneh (a tomb of a Nabatean King), the field of tombs, obelisks, the altar (Al Madhbah). From this point, you can view the whole of the rock city. Mt. Nebo believed to be the site of the tomb of Moses, Mt. Nebo commands a spectacular view across the Jordan Valley and the Dead Sea. Continue drive to the town of Madaba, best known for its Byzantine and Umayyad mosaics and at the Greek Orthodox Church of St. George visitors may view the earliest surviving original map of the Holy Land. Stay overnight at the modern capital city of Amman, formerly the Ammonite capital city. Tiberias, the old center of Jewish learning. Drive along the shores of the Sea of Galilee to Capernaum and visit the ruins of the ancient synagogue. Drive to Nazareth via Cana of Galilee. Visit the Church of Annunciation, St. Joseph’s workshop and Mary’s Well. After lunch, drive along the coastal plain to Caesarea, capital of Judea under the Romans. Visit the excavations of the ancient city, Roman theatre and aqueduct. After breakfast, start the day with a magnificent panoramic view of the Old City of Jerusalem from Mount of Olives. Drive to Israel Museum; see the Museum of the Shrine of the Book and the original Dead Sea scrolls are where they are housed. In the same complex, the model city of Jerusalem to give an understanding of what Jerusalem used to look like in 66 CE. In that fateful year, the Great Revolt against the Romans erupted, resulting in the destruction of the city and the Temple. Arrives at the Garden of Gethsemane, see the Rock of Agony inside of the Church of All Nations, where Jesus prayed his last prayer before his arrest. Nearby are the Caves of the Assumption of Mary and of the Betrayal. Temple Mount from where you can see the Dome of the Rock, a splendid mosque on the holy mount. On to the WAILING WALL, the most holy shrine in the Jewish religion. Cross along the VIA DOLOROSA to Golgotha, and visit the CHURCH OF THE HOLY SEPULCHRE. Erected over the site of the crucifixion, this church is shared by six Christian communities. Free and easy in Jerusalem all day, later on transfer to airport, returning home sweet home. We Will Transfer to the Airport for Flight Back to U.S.A.